I walked through the doorway stopping just over the threshold allowing my heels to catch the weight of the door before stepping forward and letting it click behind me. I quickly glanced around noticing candles as the only light source flickering and dancing upon their designated tabletops, each one in rhythm to a beat I couldn't hear. My eyes scanned the room for some sort of familiarity where there was none and no one and landed on a sign that read please wait to be seated. A young lady quickly walked over, made eye contact and shoved the gum she was chewing in her cheek with her tongue then asked “party of one” with a forced smile. I lifted the corners of my mouth slightly, a half smile in return, and asked if she knew where I was. She released the gum from the left side of her mouth, gave a loud smack and shoved it into the opposite cheek replying sarcastically “I’m not sure where you were but now you’re here and I need to know if you want a table, a booth or the bar?” motioning like an exhausted stewardess in the direction of each option then repeated the same release, smack, tuck of her gum as before. I chose the bar and followed her as she demanded. I hoisted myself onto the cracked leather barstool and gave a quick thank you while the clicks of the high heels from the hostess faded gradually in the other direction. A man turned around with a glass in one hand and a rag in the other, the shadows of the room made it hard to see his face. He nodded in my direction and wiped a spot on the wood surface, avoided eye contact, continued circular motions with the rag trapped under his paw and inquired “what would you like to drink” in a voice much softer than I imagined him to have. I responded with whatever was on tap, I’ve never been much of a drinker. 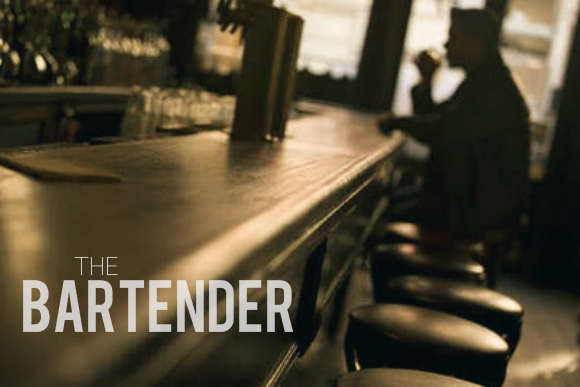 He shoved the rag in his back pocket, filled the glass with a dark liquid capped with a half inch of foam and slid it across the counter. I reached for a cardboard coaster sitting nearby and placed it under my beer, judging by the torn edges of the cloth hanging from his pants I could tell he spent most of his time cleaning this place. I lifted the glass closer to my face and inhaled the bitter aroma of musky wheat and took a swallow then another in quick succession to wash down the first. He asked “what brings you here” as he reached for a bowl of mixed nuts behind him plucking a cashew from the top of the pile before passing it my way. I wasn’t sure and I told him that. I told him the truth of the matter was I didn’t know how I got here or where here really is. I tried looking back to retrace my steps, but it was all a blur. Somehow I took a blind turn oblivious of the consequences and ended up right where I am… here. No where. He said the same was true for him and he grabbed another glass, filled it up and took a long drink emptying half the contents almost immediately. He said he stumbled through the front door just as I had, lost and confused and exhausted from following a road well-traveled. Somewhere along the way he took a detour choosing a lesser known path, gave up and ended up in this place, behind this bar, serving me a drink. He said everything happens for a reason and while I wanted to believe him, I found it hard to. Then he asked “what is it that you do” and he seemed genuinely curious to know and wasn't just asking in effort to make small talk. I picked through the bowl of nuts in front of me and decided I didn’t want any then took another swallow from my glass followed by another for the chase and started replying with the details that fill my Mondays leading to my Fridays when he interrupted... "not where you work, what is it that you do" he insisted. I write. I'm a writer. He leaned in further with the candle lighting his face and for the first time I could see who he was. Behind the tired blue eyes, beneath the overgrown facial hair and the stained tee shirt and the abused condition of his pants holding the torn edges of an overused rag was me. Suddenly I opened my eyes to see my wife asleep at my side, I could hear our daughter through the monitor on the nightstand, I could taste the bitterness of truth at the back of my throat and it was then I realized I had a dream. I realized I have a dream.